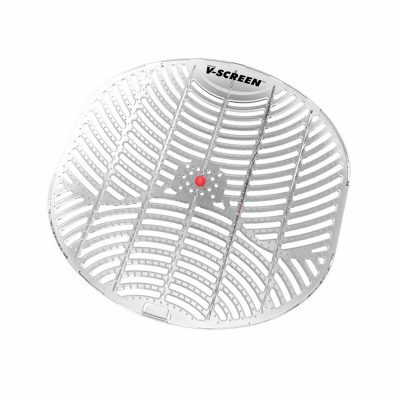 V-Screen® urinal screens offer an effective means of keeping drains & urinals free flowing while urinals smelling clean. The economical V-Screen®, fits over the drain or urinal, acting as a net to catch debris such as chewing gum, cigarettes, paper & other waste. V-Screen® is part of the 'Harmonize Your World' range of passive aircare products - avoiding the fragrance clash in washrooms. Unique web design prevents splash back & the angled anti-splash texture keeps urinal areas clean. Environmentally aware. VOC exempt & non-hazardous with no harmful solvents. Unique anti-slip feature helps keep V-Screen® in the optimum position in the urinal. Part of the 'Harmonize Your World' range - avoid the fragrance clash in washrooms. Case size: 12 screens per case (each screen is contained in a sealed bag with a hygiene glove). Case dimensions: (L) 190mm (W) 73mm (H) 220mm. Fragrance longevity: Up to 30 days (Once opened). Material: EVA (Ethylene Vinyl Acetate Copolymer).